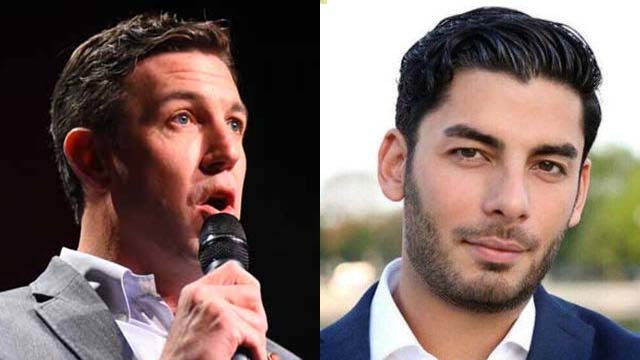 Rep. Duncan Hunter (left) and Ammar Campa-Najjar won’t meet Sept. 18 at CSU San Marcos as a Campa press release first suggested. Confusion over an email exchange led the Democrat challenging Republican Rep. Duncan Hunter to announce a much-anticipated joint appearance in September. But that face-to-face meeting isn’t happening. Turns out the campaign of 50th District challenger Ammar Campa-Najjar jumped the gun Tuesday when it announced Hunter’s participation in a candidates forum at CSU San Marcos. On Wednesday, Hunter’s campaign said it had declined to attend. And the North County college confirmed that Hunter never agreed to the Sept. 18 forum. “While the Campa campaign is disappointed that Duncan Hunter declined to attend this forum, Ammar Campa-Najjar is grateful to the university for the opportunity and is still looking forward to participating in it,” said Nick Singer, Campa’s director of communications. “The Campa campaign hadn’t yet known upon issuing the release that Duncan had declined, and was coordinating with the university on the working knowledge that the forum would be with both candidates,” Singer said. He said the news release used an “alternate provided quote” suggested by the Campa campaign, instead of the quote supplied by the school. Three hours later, a Campa-Najjar news release said the candidate forum would be Sept. 18, not Sept. 19 as first proclaimed. But Wednesday morning, Hunter spokesman Mike Harrison told Times of San Diego that Hunter couldn’t take part either day due to a schedule conflict. Late Wednesday afternoon, a CSUSM spokeswoman backed up the Hunter campaign’s account and said the Campa-Najjar campaign wrongly quoted Antoine. “The statement attributed to Christine Antoine and published in the Times of San Diego was inaccurate,” said the spokeswoman, Christine Vaughan. CSUSM said it’s in the planning stages of hosting a candidates forum. Vaughan said CSUSM reached out to the Hunter and Campa campaigns shortly after the June primary. Vaughan said CSUSM has not issued a press release about the forum. 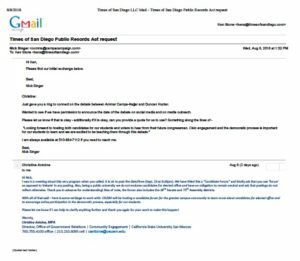 But an Aug. 6 email shared by a Campa-Najjar spokesman says Antoine wrote that it was OK to issue a news release on a September forum. She said the forum also would include candidates for the 38th state Senate and 75th Assembly districts. On Wednesday, Harrison insisted that Hunter would like to meet Campa-Najjar. For his part, Campa-Najjar doubts the schedule-conflict explanation. And the Democrat* who garnered 17.6 percent of the primary vote didn’t count telephonic Town Halls that Hunter has been holding — including one Tuesday night. Meanwhile, Mary Anne Dijak of Escondido said her church — First United Methodist of Escondido — had invited Hunter to a forum with Campa on Aug. 28, but Hunter declined. Asked about news of Republican Rep. Chris Collins of New York being indicted on insider trading charges, Campa-Najjar pivoted to the federal investigation of Hunter. His campaign also issued a news release calling on Robert Brewer, the White House nominee for U.S. attorney in San Diego, to recuse himself from the probe of Hunter’s spending issues. He called for swift justice in the Hunter probe. Campa-Najjar says he’s “not banking” on Hunter being indicted to beat him. “I think we’re going to beat him on the issues,” he said. Harrison, the Hunter spokesman, contacted Times of San Diego about its story Tuesday signaling a September candidate forum in San Marcos. Correction: An earlier version of this story incorrectly called Campa-Najjar a Muslim-American Democrat. Times of San Diego regrets the error.